﻿ Mod installer & auto-update tool - would you use it? Mod installer & auto-update tool - would you use it? I'm thinking of making a little program that will list all existing RimWorld mods, downloads the ones you want and updates them when necessary. Would anyone be interested in using it? And, more importantly, would you guys who make the mods be interested in adding your mod to yet another database? But of course this won't get anywhere if you guys don't think it is a good idea. Especially mod makers, I need your opinions because without your support the database would be empty and useless. So please let me know what you think. Personal text? What personal text? Re: Mod installer & auto-update tool - would you use it? I think that would be just awesome! There's a limit for human intelligence. But not for dumbness. Huge +1 from me. I've thought about starting to write it myself more than once, but it's a) going to be a lot of work and b) should ideally be done in some form of co-operation with Tynan as it would potentially be a big deal in the community and thus for the game as a whole. I support this idea. And if it is any help, I maintain the unofficial Alpha 8 mod list thread and would be willing to offer my services to converting the information there into a format that you choose to be read by the program. If there is anything else I can do to help this project along then don't hesitate to ask me. I'm currently working on a prototype that will serve as a basic mod manager with install and uninstall functionality (manual downloads). From here, if there is enough support from mod makers, the next step will be to add a "mod gallery" part that is linked to an online database where people can upload their own mods. When this is done, I will make a "launcher" version that will auto-update and then launch the game (this could potentially be a full-fledged launcher to edit the in-game settings as well, but I don't think this would be really necessary). This all will take a while to be completed, but I expect to have the first version (without mod gallery) ready soon. and b) should ideally be done in some form of co-operation with Tynan as it would potentially be a big deal in the community and thus for the game as a whole. I don't know if cooperation would really give it much of an advantage. With input from the community we can make this little tool great on our own. I'm thinking of using the existing about.xml file to add some data (like mod version) to the mods to use in the gallery system. I maintain the unofficial Alpha 8 mod list thread and would be willing to offer my services to converting the information there into a format that you choose to be read by the program. If there is anything else I can do to help this project along then don't hesitate to ask me. The way I see it, individual mod makers should add some information to their mod and then upload it to our database. I've noticed that not all mods are packaged in the same way (.zip, .rar, .7z files, sometimes with the content in subfolders, sometimes without subfolders...) so it would be quite a lot of work if we had to go through all these mods and fix them and format them in the correct way, while the mod makers (who have their mod source available) can just add those few lines of data to their mod, point the program to the directory, and let it do the work of packaging and uploading the file (yes this will be done inside the program, makes it easier for me to manage the file structures and such). Good point. I was already planning to add a "rating" box to see how many people like each mod, but statistics like number of downloads and activation rate can be easily tracked as well. 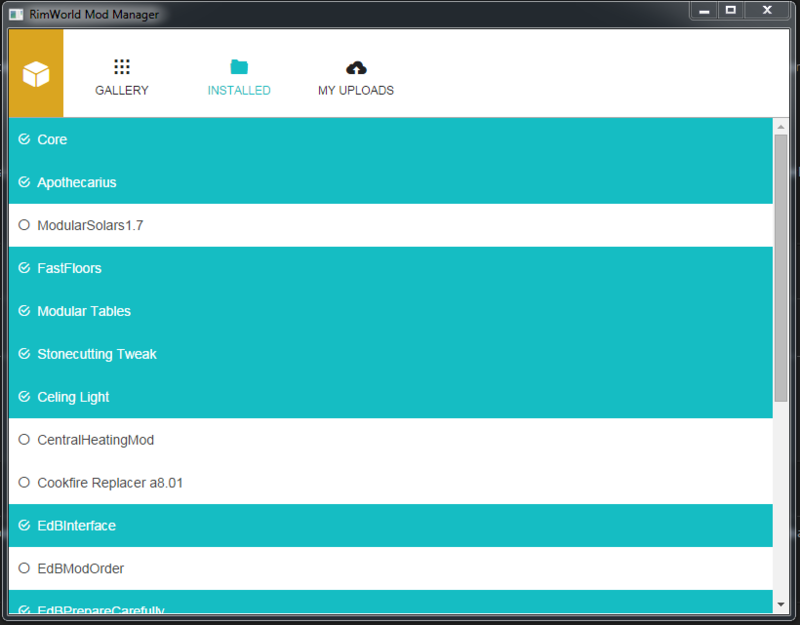 Screenshot of the basic mod management interface as I'm working on it (how it will work: click to enable/disable, drag & drop to reorder). What do you guys think? How do you plan handeling diffrent directory names? For exsample project armory rename it's main directory to not interfere with precise version. Should we be forced to make a modmaneger version to have it function properly. (it's not a problem ) just a public question on how sensitive it will be. Also will there be a way of handeling mod version numbers? Since the tool will eventually include auto-updating, I'm not going to account for different directory names. I will ask modders to add something like a <modVersion> tag in their About.xml file (I've tested this and RW doesn't seem to mind extra tags in the xml, and this seems a cleaner solution than adding an extra file), and the program will use this version tag to determine the version of the mod and check for updates. The directories will then be managed by the mod manager. I'm thinking of using different directory names for managed mods altogether (e.g. "mod_" in front of the folder name) so I don't interfere with for instance development versions of the same mod or manually installed mods. The tool will do the packaging and uploading to the database though, so once you've added the exta xml tags you'll simply have to click "upload" inside the program, browse to the mod directory and let the program do the work. Implementing <modVersion></modVersion> to project armory and other mods I have just because I can! Quick question: what's the path you guys put the RimWorld game in? I always put mine in D:/Program Files (x86)/RimWorld but I know that there's probably a lot of people who put the game in a different folder. You'll be asked to set the path if the program can't find the game files, but I want to add a number of possible and often used paths for the program to check automatically so you don't have to input it manually. And i have the game on the desktop on my girlfriends new laptop. And if the game is not found, the program will ask where your RimWorld folder is. Out of interest, what are you writing this in or is that a stupid question? "The only time you have too much fuel on board is when you are on fire."